Usually guac won’t last more than a day without browning. 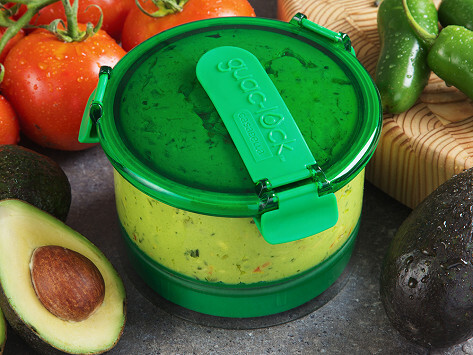 But this guacamole container creates an airtight seal that keeps oxygen out, so it stays green and fresh for days. (It’s great for hummus, salsa, and tzatziki, too.) Push the the container’s base to remove the air, which raises the guac to the top. The push feature comes in handy as you start enjoying the dip—give a press and it lifts the contents to the top and avoids the need to scrape dip off the sides. We love guacamole and this makes it possible for us to have fresh guacamole for days. It really does save the quac longer. Love it. Really works! Bought one for my sisters. 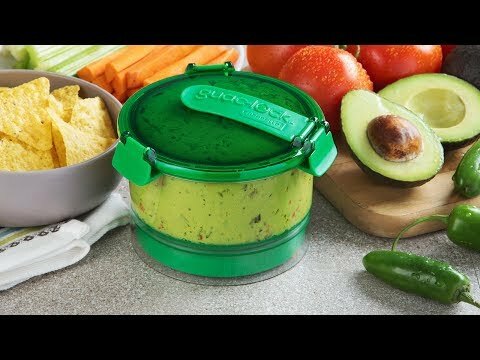 This works fantastic to keep guacamole fresh! As a test we left a very small amount in the container as a test, and left it in for about a week. It was still good! Not that our guacamole usually lasts that long! But as a rule I make a large amount (10avocadoes) to go with my 3 dozen taquitos. With this, my left over guacamole works great with my left over taquitos. My only 2 improvement recommendations would be 1) make a bigger size and 2) a more decorative “party friendly “ style so you could make the guacamole and serve it and store it in the same container. I bought these as gifts and everyone love how fresh they keep the guacamole!